When contemplating Rublev’s Icon of the Holy Trinity, it is almost inevitable that some will ask: Who’s Who? Though the Three Angels are similar in appearance, their clothing is distinctive, and so certain minds will naturally seek to read meaning into their colours and Who they represent. Whether the question is even appropriate is a matter of debate, though the very human need to cross every “t” and dot every “i” means that it is certainly not a modern one: answers do exist. Early icons from the first millennium did on occasion identify Christ among the Trinity at least. An example from the early 5th century is of a mosaic from the Saint Maria Maggiore in Rome. In it, Abraham greets the Three on bended knee; the central of the Three men is cloaked in a mandorla, with his hand raised in a blessing – identifying Him with Jesus Christ, the Son. Identifying the pre-Incarnate Christ among the Three Angels, but not identifying the other Two, crops up in isolated Icons for centuries afterwards. The most usual way of identifying Christ would be to give the central Angel seated around the table a special “I AM” cross-halo, which is only associated with Jesus Christ. However, this practice was condemned by the Stoglav Council (Стоглавый Собор) of 1551. The Council also recommended that the Icon not explicitly name any of the Angels, but instead carry the inscription Svyataya Troitsa (Святая Троица), i.e. : “Holy Trinity”. This practice spread out from the Russian Church and is now generally followed by all Orthodox Iconographers. To the left is the Father, Who is seated beneath Abraham’s “tent” as described in the Genesis account; yet in the Icon the tent is shown as a magnificent castle: the open-doored House of the Father, the goal of our journey. He is shown clothed in garments which seem to shimmer, reflecting the Heavenly Glory. To the right is the Holy Spirit, clothed in green and blue hues: the colours of the Earth. These are also the colours of the Holy Spirit, as He “…is everywhere present and fills all things…” according to the Orthodox prayer. In addition, Orthodox churches are decorated in greenery at the feast of Pentecost (the descent of the Holy Spirit upon the Apostles), and worshipers wear green. The Holy Spirit is seated beneath a mountain, which represents the spiritual ascent all believers must experience. And so in the centre is seated the Son, or Word of God. His clothes are the typical bright red cloaked in blue, often seen on Icons of Jesus Christ, representing the Divine (red) and human (blue) natures. Over his right shoulder there is a band of gold; as Isaiah prophesied: the Government shall be upon his shoulder. Towering above Him is the oak of Mamre, yet within this icon is revealed as a foreshadowing of the Cross, or tree, from which Jesus would be hung. With this in mind, we can see that what the Icon shows us is not the three individuals of the Holy Trinity, but the relationship between Them. Of the Three, the Father on the left of the picture is the only figure to be unbowed, displaying a fatherly authority over the other Two. The Holy Spirit and the Son together bow to the Father, so that we can clearly see the Father to be the fountainhead of the other Two: from the Father comes both the Word (the Son) and the Breath (Spirit) of God. Contrary to the formulations of heretical theologians, the Holy Spirit does not bow before the Son, nor is He depicted as the love which flows between the Father and Son, but as a person in His own right, in a relationship with the other Two. The Son of God is shown as though in conversation with the Father, which is what is revealed to us in the Gospels, where Jesus frequently prays to the Heavenly Father. Despite the authority of the Father, all Members of the Holy Trinity are shown equal in size, and the reverence of the Son and Spirit to the Father appears voluntary; it is done out of love, not fear. Yet we must be careful to separate what is revealed to us by God, and is therefore salvific, from that which is formulated by arrogant “over-philosophizing” and can therefore lead us off in dangerous directions. We can look upon the Icon of the Holy Trinity and contemplate the relationship of the Father with the Son and the Holy Spirit, yet we must not try to concentrate too much on the Three figures as separate beings. The canons of the Stoglav Council are therefore useful in that they encourage us to look at the Icon in the most beneficial way. We are not invited to look at “the Father, the Son, and the Holy Spirit” – three individuals – but instead the Holy Trinity: a Tri-Unity toward Whom our prayers are directed. This entry was posted in Apologia, History, Iconography and tagged Angels, Holy Trinity, Iconography, Old Testament, Rublev, Russian Icon, Stylism. Bookmark the permalink. 27 Responses to Who’s Who in the Trinity Icon? I love icons and I love the Holy Orthodox Church. But this particular icon I believe to be non-canonical. This blog entry I found really explains why. http://onbehalfofall.org/2010/05/29/icons-of-the-trinity-they-dont-exist/ What is your opinion of this subject? Sorry for the late reply; I have been away for the last week. This blog is for icons of the Orthodox Church, and hopefully presenting them without too much opining from myself. I have to choose the subjects, but in there I am generally guided by the most common and widespread images, and write about them. This is why the icon of the Holy Trinity is one of my earlier posts: it is just so widespread as to not be ignored. It not only occurs “by itself” as an icon, but often as part of an icon on a different subject, not to mention in the frescoes of churches and monasteries. It may be that you disagree with the post above, which identifies the three angels of the Holy Trinity icon specifically as Father, Son and Holy Spirit. Many would agree that it is wrong to do this; yet they would not go so far as to say Rublev’s icon is wrong as a representation of the Holy Trinity. Bl Augustine says of Abraham’s meeting with the angels at Mamre: “Do you see that Abraham meets Three but bows down ro One?… Having beheld Three, he understood the mystery of the Trinity, and having bowed down to One, he confessed One God in Three Persons.” Other Church Fathers have given the same interpretation, including St Cyril of Alexandria. It’s not the only opinion expressed though – and earlier church fathers have said that the three angels at Mamre were Christ, accompanied by two angels. It could be seen that the Holy Trinity icon of Rublev’s, coming in the 14th century and being so widely accepted, is an answer to the ongoing debate of earlier centuries. On the article you linked to, I’m afraid I don’t see the church councils mentioned as referring to the icon of Rublev. The councils are referring to the “New Testament Trinity”, which depicts the Three Persons of the Holy Trinity as Jesus Christ, an old man (the Father), and the Holy Spirit as a dove. Anyway, I have given my opinion in the end, for what it’s worth. If you can find out anything more please let me know. Actually, from what i understand (I believe i got this from Ouspensky/Lossky), there was a council in Russia in the 1500s which declared Rublev’s icon to be the standard. The “old man, young man, and dove” painting (“New Testament Trinity”) is indeed non-canonical or even anti-canonical, for by showing age and youth, it introduces aging into God, and makes of the Spirit a different Nature than the other two Persons— apart from the fact that it violates St John’s dictum that “no one has seen God at any time” (Jn 1.18). Rublev’s icon, and icons like it earlier or later, is popularly, but not properly called the “Holy Trinity”. It really is a depiction of the Hospitality of Abraham. 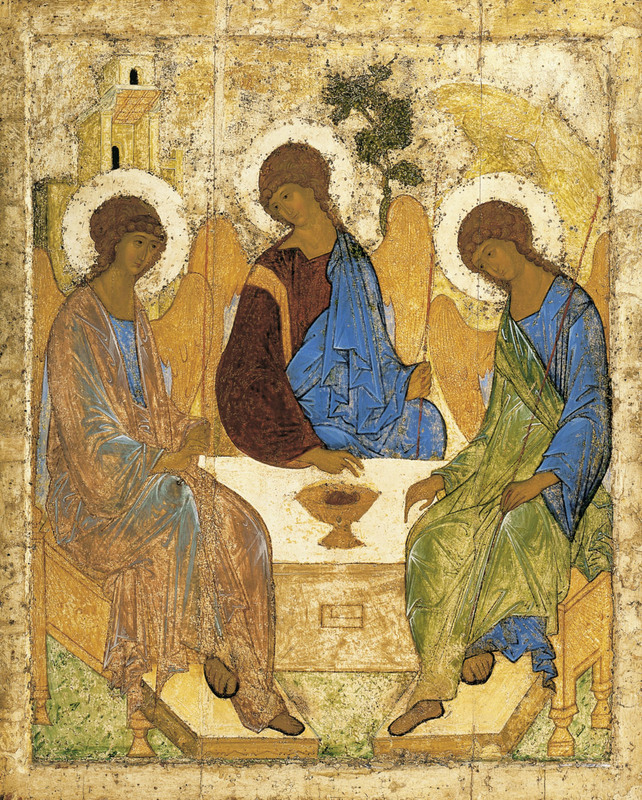 Rublev, whose instincts were entirely Orthodox, cannot have set out to depict the Trinity itself, precisely because “no one has seen God at any time”. So what he painted was a story in Scripture, not his imagination of what “the Holy Trinity is like”. The icon is an image of the Theology of the Trinity, based in the story of the Hospitality of Abraham (Gn 18), not an image of the Trinity as such. Granted that is the ‘most popular’ explanation, but is it the right one? The problem with reading the figure on the left as the Father is that it places the Son at the *left* hand of the Father. That simply can’t be! It’s neither scriptural, nor creedal, and the enthronement of the Son at the *right* hand of the Father is an extremely important doctrine in both contexts (scripture and creed)! That reading also places the Father in front of the building, which would have to symbolize the Church, and the figure of the Spirit in front of the mountain, which is a symbol of the “Most High” (El Shaddai, according to some scholars, the ‘God of the Mountain’), who is always associated with the Father in Scripture. It’s at least reassuring that the ‘Son’ is correctly identified in what you wrote as the figure in front of the cruciform tree (and in Rublev’s icon, doesn’t the foliage on the tree look rather like a man on a cross, though his knees are bowed). And he is dressed, as is fitting, in the red of flesh and blood and the blue of heavenly divinity. The figure on whose right he sits (and again, we must expect him to sit ONLY at the right hand of the *Father*!) is dressed in the green of creation and the blue of divinity; blue on the inside because that is his nature, and green on the outside because that is his action. The red of the ‘Son’ is on the inside because he took human nature into the divinity, took it most intimately to himself. The ‘Spirit’ figure on the left of course has blue on the inner garment, suggesting his divine nature, and he is otherwise clothed in a garment of light, as we would expect, since he is the ‘Giver of Light’. And finally, if the figure on the *left* is read as the Father and Source, then the circularity is destroyed: he gazes at the ‘Son’ or he gazes at the ‘Spirit’, but that makes a sideways V. If, however, the ‘Father’ is correctly located on the right, in front of the mountain, then he gazes at the ‘Son’, who gazes at the ‘Spirit’, who gazes back at the ‘Father’. And that is how the intra-trinitarian life is described by all the fathers of the church. In all the discussions i’ve read, the argument is always over whether the figure on the left, or the one in the middle, is the ‘Father’. No one seems ever even to have considered that it might be the one on the right. But this argument seems to take place mostly in the abstract. Isn’t anyone actually *looking* at the icon?? I agree with you John Burnett with all you’ve said. I can see the same, Father on the right side of the picture, the son in the centre and the Holy Spirit on the left side also; and I agree that Jesus must be seated at the right hand of God. The Bible’s emphasis of this is clear. And what you said about who’s looking at whom, I agree with also. Have you noticed how the Father (far right of picture) and the Holy Spirit (far left of picture) mirror each other in their foot gestures, despite this action for the Holy Spirit figure would not be the easiest or most comfortable to achieve – a right leg crossed over the leg is a normal positioning of crossed legs (shown in the Father figure – far right of picture), but the Holy Spirit figure (far lef of picture) has His right leg tucked under the left leg; not the most comfortable or easiest to achieve; see if you can yourself, paying attention to the angle and direction of the foot. All this makes me think that the mirroring of the feet positioning wasn’t an accident, but represents something. Also the hand gesture of the Jesus figure (centre of the picture), which is also seen in the Holy Spirit figure (far left of picture); does anyone know what this symbolises? That gesture is simply the standard gesture of priestly blessing used by priests in the Orthodox Church. The figure is blessing the cup, which by the way is pushed to the forward edge of the table, as if inviting the viewer to partake. More could be said about the cup. Note also that if you follow the lines of the image (i hope i can make this clear), using the bottom horizontal of the altar/table as a base, and tracing up the leg to the knee and on up to the shoulder of the figure on either side, the shape of the chalice on the table is repeated in the ‘negative space’ defined between the two outer figures. The angel representing the ‘Son’ would thus be sitting within the ‘chalice’ so defined, just as the lamb’s head is resting in the chalice on the table. The Son is himself the ‘lamb slain from the foundation of the world’. And in this way the icon reveals the life of the Trinity, already suggested in the mutual, and circular gaze of the three figures as i pointed out above, to be one of self-immolation and communion. The bolder colors of the ‘Son’, in contrast with the more receding colors of the other two figures, also dynamically projects the ‘Son’ as the substance of this event of communion toward the viewer. The table has the same shape as the cup, since the knees of the two angels on the sides obscure it on the left and right. So there is a trinity of cups, really— reading from bottom to top, the shape of the table, the cup itself, and the empty space between the two side angels, and as far as possible, they are depicted as “inside” (co-inhering; perichoretic with) one another. So the meaning of the table is the same as the meaning of the cup but, being a table, it recalls the Holy Table, that is, the Altar in a church; that is, the Mystical Sacrifice. Which of course is a theme repeated in the fatted calf’s head in the cup, and in the presence of the Son within the big chalice shape defined by the figures on the right and left. I confess i am defeated by the square figure in the base of the table/altar. Squareness of course is a figure of the earth, the world, the four directions, etc, and that is somewhat satisfactory, but i have never found this adequately interpreted and though i like the idea that the earth is the place of sacrifice, i can’t say i find this interpretation quite adequate, and haven’t yet discovered a relationship to Scripture there. Just to throw a completely different perspective on this: the three figures depicted are angels ( with wings ! ) could it be that this not the Trinity at all , but the three archangels identified within Holy Scripture, ie Michael, Raphael and Gabriel ? Angela, we may read them as angels, because the Scripture calls them “angels”, but we may not name them because the Scriptures do not name them. Since the Scriptures do not name them, naming them would be merely speculative on our part, and neither icon-painters nor icon-readers are to add their speculations to Scripture. The purpose of an icon is to teach theology, not to inspire fantasy. But we can say they are “angels” because the Text calls the three “men” who visited Abraham in Genesis 18.2 “angels” at 19.1. And, obviously, they have wings! But of course the Church has always read the story in Gn 18–19 as a pre-revelation of the Trinity. So the iconographer has to use the three “men” who are “angels” to represent the Three Persons of the Trinity typologically. So the icon is not an image of the Trinity itself; rather, it is an image of the theology of the Trinity. There’s a big difference here, worth thinking about. The actual story in Genesis 18 is ambiguous about the identity of the three “men” who appeared to Abraham. “The Lord“— only one Lord— “appeared to [Abraham] by the oaks of Mamre” (Gn 18.1)— but Abraham “lifted up his eyes and looked, and behold, three men were standing in front of him” (18.2). So apparently the One Lord appeared as three men. Moreover, “they said to him, ‘Where is Sarah your wife? '” (18.8), but at Abraham’s reply, “the Lordsaid, “I [singular] will surely return to you about this time next year” (18.9). Later (18.22), “the men” go away while Abraham is still standing before “the Lord”, apparently one of them (Gn 18.22), and Abraham and he then conduct their famous bargaining episode; our suspicion that “the Lord” was one of the men is confirmed when we learn that only “two angels” came to Sodom where they were met by Lot (19.1), who act as two throughout the story until they say, “Escape there quickly, for I [singular again] can do nothing till you arrive there” (19.22). The icon takes from this whole double episode only the unity and distinction of the one and the three and zeroes in only on the meal (with eucharistic overtones) that Abraham set before them. Some examples of this icon show Abraham and Sarah in the background and in that sense the image leads one to contemplate the scriptural text more fully, but Rublev leaves Abraham and Sarah out, and focuses only on the three at their common meal, depicting in them more specifically the Church’s trinitarian theology. Now, in depicting the theology of the Father, Son, and Spirit, there is need for great subtlety, and Rublev does not fail us. “No one has seen God at any time” (John 1.18), so he could not depict the Father, nor in fact the Spriit. He could, of course, depict the incarnate Son, but the hospitality of Abraham happened before the incarnation, so he can’t depict any of the angels as Jesus. But he can suggest that one of the angels is the Son by using colors, gesture, and background which suggest the incarnation. So that is why the central figure is dressed in red (earth) and blue (heaven), is blessing the Cup, and is sitting in front of a cruciform tree. The central figure is the focus of the icon, so it’s from there that we can puzzle out the ‘identities’ of the other two, because we know that the Son “sits at the right hand of the Father”, and so forth. But in drawing the other two figures in a way that resembles the one in the middle, Rublev is dynamically showing us that we do not know the Trinity except through Jesus Christ— and that God is like Jesus, a very important theological point especially these days. He is also showing how we know the Father and the Spirit through the Son— by contemplating Jesus and his relations to the one he calls Father, and to the Spirit whom the Father sends. Thanks John. I’ve wondered that same question. Even the coloring of angels in our icons traditionally is interesting to contemplate: Gabriel with red and blue, Michael with a lot of gold and red, Raphael often with green–but perusing icons on the internet, these colors are not consistent it seems. But, I would guess/speculate that Rublev could have used Michael, the chief archangel as representing the Father, Gabriel who is so tied with events in Christ’s life as representing the Son, and Raphael the Healer with the Holy Spirit? Theologically, I like your explanation above better than my “speculation”. Brent, Rublev couldn’t have used any of the named angels as models for several reasons. First of all, one of the chief rules of iconography is that the image must be an image of the person himself or herself; we cannot substitute the image of one person for another. That is why icons may not be painted from models, as in western paintings, but only from previous icons. So you couldn’t depict Gabriel as Jesus, or use Gabriel as a “model” for Jesus, which in effect is what you’d be doing. To use the angels as models would generate confusion as to whether Michael was himself the Father, Gabriel the Son, and Raphael the Spirit. As persons they are distinct from the persons of the Trinity, and may not be used to “model” the Trinity. Also, the relationship between them is not the same as the relationship between the Three Persons, and it’s precisely those relations that this image so brilliantly reveals. When the Synod of Moscow in the 1500s (i forget the exact year) declared this icon to be the canonical icon of the Trinity, they also forbad the specific identification of any of the figures as “Father”, “Son”, or “Spirit”— an error we do find in some examples. Interestingly, by the way, as far as I’ve ever seen, icons in which the figures are labeled always wrongly label the figures, placing the Son on the left hand of the Father, which shows a failure to understand the icon. But that’s no surprise— I haven’t found a commentator yet who gets it. That the “Father” is the angel on the right side is not even considered by any of them; the question is always whether he’s the one on the left or in the middle. No one notices that this always puts the “Son” on the “Father’s” left hand, a scriptural impossibility. As i said before, the icon is an icon of the theology of the Trinity, not of the Trinity itself, nor especially of the Father, because “no one has seen God at any time” (Jn 1.18) and it’s impossible to depict him. Also, while the biblical Text does call the three figures “angels”, it also calls them, and one of them, “the Lord”. It would not be possible to identify Michael, Gabriel, or Raphael as “the Lord”. But because it calls one of them “the Lord”, then it is possible to depict one of them as “the Lord”. But of course we know only “one Lord, Jesus Christ, the Son of God, begotten before all ages, Light from Light, true God of true God, of one essence with the Father”, etc. So that’s effectively what Rublev does, by means of the central figure’s clothing, gesture, and accoutrements, and then he works out the other relations from there. But he does not put a cross in the halo, as we do for Christ alone, nor the words, “Ὀ Ὦν” (I AM), because this is a symbol for the pre-incarnate Lord, not yet the Son of the Virgin. In this way the icon does an amazingly skillful job of balancing the unknowability of God, the historical event in Genesis, and the revelation of the Trinity, which we know only in and through the (not yet) incarnate Son. Without saying what cannot be said, Rublev leads us to the trinitarian experience of God that we have in Christ. If we say, then, that any specific figure in the icon portrays any specific person in reality, we have to say that the central figure portrays Christ pre-incarnate. And since Christ alone reveals the Father, we know that the Father is like Jesus. And the Spirit manifests both Jesus and the Father to us. So that is why, actually, all three figures look like the figure in the middle— the one who “is” Christ. None of them looks like Michael, Gabriel, or Raphael; they all look like “the Lord”— only not quite, because this is, after all, the icon of the Hospitality of Abraham and not really of the Trinity, whom no one has ever seen at any time. In the last month I keep bumping into this icon in many different areas of my life and feel strange connection. One is through Richard Rohr who talks of the square on the front of the table having been originally where glue and a mirror was attached inviting us to join in the divine feast/dance. Is there any research to back this up? No i have never heard that before, and can’t even imagine it’s true, given everything else i know about icons. Would it even make sense in terms of the other structures in the painting as i’ve explored them? Is there any evidence in the picture itself that something is missing that used to be there? Is there even a single example of another icon that has any feature like that? Where would Rohr have even gotten such an idea?? But then i had a teacher, an evangelical, who published a paper in a respected journal, in which he referred to each of the angels as “she”. I have very little knowledge of iconography but Rohr refers to “several art historians” in his blog last week on CAC and just thinking if that was the case then maybe the Trinity could be a mirror image so the Father would be on the left and there would be means for deep mediation on nature of God and our relationship with the Divine. Just a thought. The Father can’t be on the left, because the Son would then be seated at the left hand of God, a scriptural impossibility. But also the figure on the left is in front of a building, which would be an image of human reality, hence the church. The figure on the right is in front of a mountain, which is an image of natural reality and the place of the “Most High”. The icon doesn’t make sense if you denominate the figures from left to right. Or at least, you will have to come up with some pretty clever explanations to force it to do so, whereas seeing the Father on the right instantly clarifies everything. The icon itself is already means for deep meditation on the nature of God and our relationship with him. That’s what the chalice is about. There were mirrors in the 1400’s. They appear in art from that time period. They are not the same type as we use today. I am not saying that was indeed a place for a mirror on the icon but it is not impossible. There were indeed mirrors in the 1400s BC! But aside from the fact that there is no evidence on the actual icon itself (just look at it!) for any kind of an object glued or inset into that place, what makes the presence of a mirror there impossible is the very understanding, theory, and function of an “icon”, in the Orthodox Church— and St Andrei Rublev was certainly a deeply traditional iconographer of the Orthodox Church! In Western art— especially from a little after the time of Rublev, in fact— artists have used a much wider degree of personal freedom than is accepted in the Orthodox iconographic tradition, which chooses to work within rather strict restraints. Those restraints would not include putting a mirror in an icon to show that you are “part of the dance of the Trinity”. For another thing, this is not an icon of “the Trinity”, because you can’t actually make an icon of the Trinity, much less show yourself to be part of its “dance”. This is an icon of the visitation to Abraham and— well, you weren’t there, so you couldn’t have been part of the dance! But as i said, all you really have to do is just look at the painting. There’s no evidence that anything was ever glued to or inset within in the box-like figure in the base of the table. I wonder where Rohr even got that idea? Actually the so called”mirror space leads the viewer into the fellowship into the center of the cup. It is an invitation to come into the intimacy of the Trinity of God’s love. Once you are drawn in you become surrounded like an invisible circle of God’ s Presence…. That to me is the point of all icons to be seen in an intimate way and drawn in by love even though God knows your unworthiness …. Always on the cup and the “tree”.. The platform under their feet is to solidify their importance as the center of the purpose. I hope this helps it is to easy to intellectually analyse in an aesthetic way….that is too detached from the purpose. Thank you for this Jerry, invitation is so wonderful – no judging, beyond words or reason. We are all joined/invited in this way. I found another copy of this extraordinary icon last week – near the altar at King’s Chapel, King’s College in the Strand next to Somerset House. Heart catching. Please forgive my ignorance, but why do they all hold staffs? I wouldn’t say that it’s “enough to remember that ONLY the Son put on flesh”, but it’s necessary to remember that. But the icon is not even trying to be an image of the Trinity itself (for that is indeed impossible! ), but to communicate, through color and form, the theology of the Trinity, which theology would include the Son’s incarnation as well. That is the meaning of this icon, and in that sense, Rublev’s achievement is unsurpassable— for when read correctly, it communicates a most profound and moving experience of the Trinity, and of the eternal meaning of the incarnation.